A network provider’s job is simply to help you get an Internet connection, whether you’re at home or your favorite coffee place. 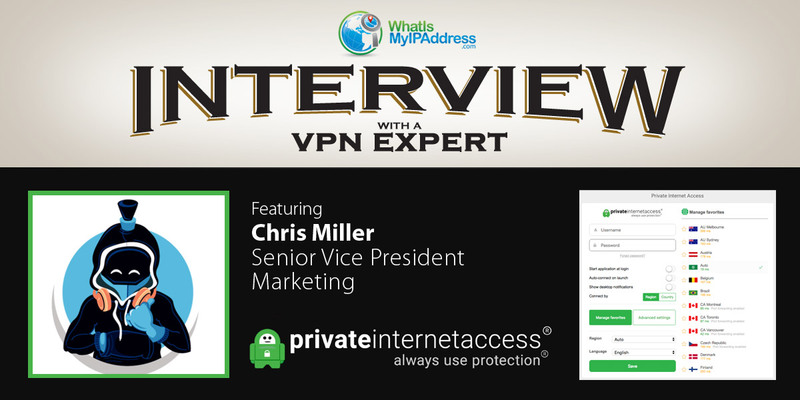 In an interview with Chris Miller, Senior Vice President of Private Internet Access® VPN, it’s clear that everyday Internet users (like you and I) need to be reminded of the security and privacy issues with the secure and unsecure networks we use every day. Private Internet Access is a leading VPN service specializing in secure, encrypted VPN tunnels that create several layers of privacy and security, providing you safety on the Internet. CHRIS PARKER: What are the consumer “hot buttons” today to get their attention regarding privacy and safety online? CHRIS MILLER: Every time someone (like Hillary Clinton) or something (like Equifax) gets hacked on the Internet, consumers wonder how they can avoid the same fate. Though many hacks online are a result of phishing or other more direct attacks, the process leads to education on privacy and safety online and invariably leads to VPN. Breaches of large companies reminds consumers that businesses and their end users face the same online privacy and safety concerns as individuals. Similarly, like it or not, Facebook’s issues are a hot button that may have been the first time people thought deeply about privacy. CHRIS PARKER: When you look at the state of the Internet today, what is the best or single most important reason to use a VPN? CHRIS MILLER: The state of the Internet today is the single most important reason. We must use the technology available to preserve our right to privacy. CHRIS PARKER: If you could give someone instances where they should definitely be using a VPN, what would those situations be? CHRIS MILLER: First, it would be when using a new public Wi-Fi hot spot. This protects against unknown snoopers on that network, and it also keeps your information from being sold by the service provider. The second would be when using your home Internet or any Internet that you use regularly, such as at work. This allows you to maintain your privacy and keep your Internet history from being used to generate ads, for instance. And if your public or private Internet provider censors something, a VPN can help as well. CHRIS PARKER: What makes Private Internet Access VPN stand out from your competitors? CHRIS MILLER: Private Internet Access made a commitment to both the open source community and to open sourcing our clients. Our no-log policy is industry leading and there have been court proceedings/evidence highlighting its presence. CHRIS PARKER: Is there a segment of the population that needs more education regarding VPNs? CHRIS MILLER: It’s possible that many Internet user probably doesn’t have an Internet connection at home...they rely on just a mobile data connection. For them, free public Wi-Fi is the norm, not private Wi-Fi at home. Thus, education on the dangers of public Wi-Fi, or Wi-Fi in general, are lost and that segment. CHRIS PARKER: How does Private Internet Access ensure the privacy and/or anonymity of its customers? CHRIS MILLER: Private Internet Access keeps no logs and constantly evaluates and audits our code and to ensure that the service we provide is private and secure as promised. CHRIS PARKER: What is the single leading misconception about VPNs? CHRIS MILLER: That any VPN, including a free one, will provide you with complete privacy and security. If you turn on the wrong VPN - one that is malicious - you’ll actually be sending all your information to be logged and sold. In fact, some VPNs even inject ads back into your browsing experience. Private Internet Access does not. CHRIS PARKER: In addition to using a VPN, what three services or products should everyone use to help ensure their online privacy and safety? CHRIS MILLER: Users should use end-to-end encrypted messaging apps, encrypted storage apps, and password managers. There are many other options too! CHRIS PARKER: What should be on our minds when we jump online? CHRIS MILLER: Assume the worst can happen and keep your eyes open. Trust, but verify. STAY SAFE, PROTECT YOUR PRIVACY AND IMPROVE YOUR ONLINE ACCESS.